I have been a member of Gwynnie Bee for over four years and I continue to be one of the company's biggest fans. I love the ability to rent clothing, wear it once or a thousand times, return when I'm over it or even have the ability to purchase it if I fall in love. 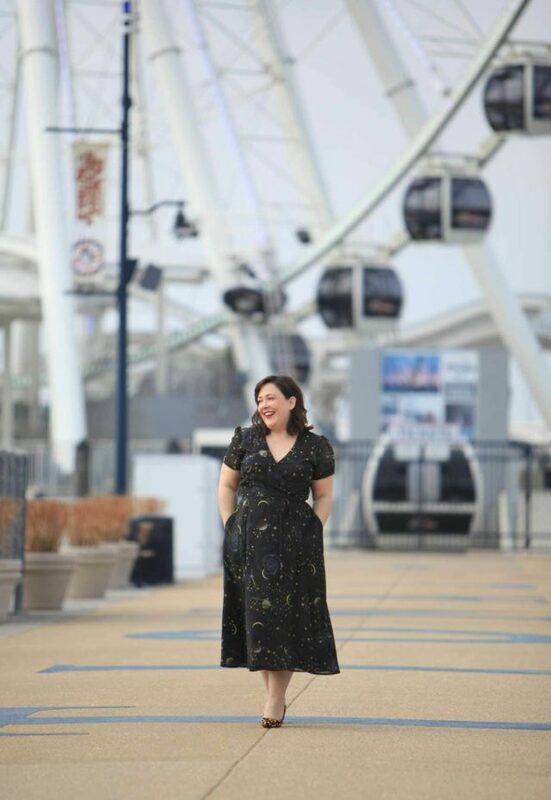 Gwynnie Bee has also provided the opportunity to try new-to-me brands, silhouettes, colors, and fabrics without buyer's remorse. Often I add to my virtual closet items I would normally not gravitate towards to try, knowing I can throw it right back in a pre-addressed shipping bag and get a new piece in just a few days' time. This dress is a perfect example. I'm not one to wear novelty prints, it's just not my personal style. If I came across this dress in a store or even online I'd likely scroll right past. But I decided to try it with Gwynnie Bee and I love it so much I've held onto it for over a month. This is my third time wearing it! These photos were taken at National Harbor on the pier and in the AC Hotel entrance. I wasn't sure which shoes to wear with such a pattern but you know me, leopard is a neutral! This is such a fun and flattering dress and hello pockets! It's just such a good example of why Gwynnie Bee is so great. Great fashion, great brands, a chance to get outside your brand or color or silhouette comfort zone without regrets. I'm so proud to have been a Gwynnie Bee partner over the years; some of my best blogging memories are with Gwynnie Bee. I hosted my first event with Gwynnie Bee at a happy hour in DC a couple years ago. If you have insomnia you may come across me in the Gwynnie Bee informercial. And last summer I was Gwynnie Bee's featured influencer and went up to NYC to host an event at their pop-up shop. 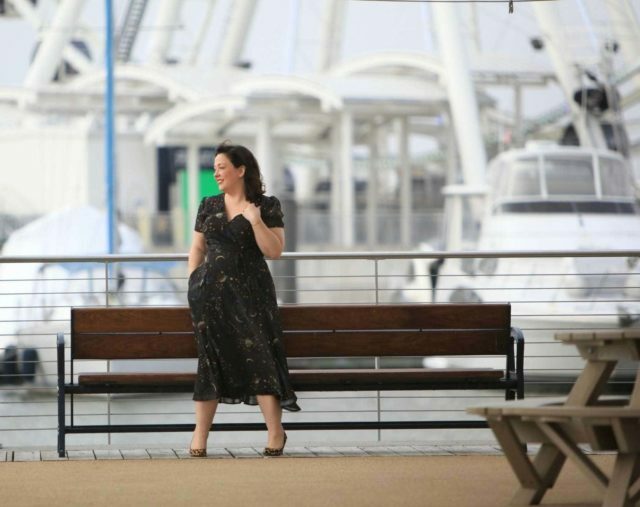 Gwynnie Bee is such a cool company, and the people behind the brand are equally as awesome. Gwynnie Bee is sweet enough to celebrate you by offering one Wardrobe Oxygen reader a three-month subscription of two items. That is a value of over $200. You will receive two items at a time, but you can return them separately at any time and a new piece will arrive, always allowing you two pieces at home. 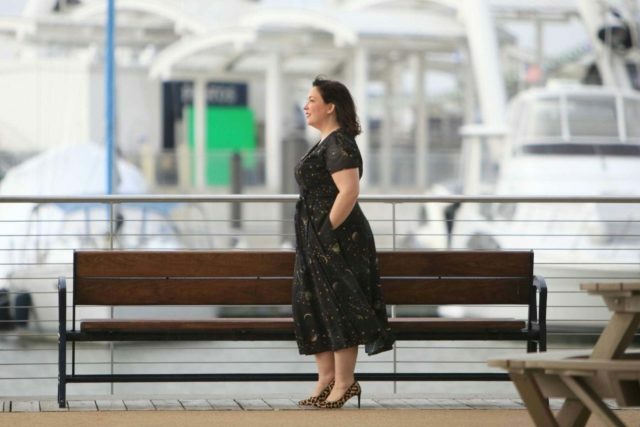 While Gwynnie Bee started as a clothing rental company just for plus sizes, the brand is gradually increasing their size range to include sizes 0-32. The size options keep increasing and so does the style! I had to cancel my subscription, so I’d love to start it up again. WOW! you look spectacular ! What an impeccable look. I love playing with patterns but tend to avoid purchasing anything too bold aside from scarves or tops because a bold print is obvious when worn regularly. GB would be perfect for adding some fun pattern to my wardrobe! I’d love to try Gwynnie Bee out. As someone who had a pretty easy-to-dress body type before having kids, a few years later, I’m still struggling with how to flatteringly dress my now-cusp-sized self. I tend to play it really safe? 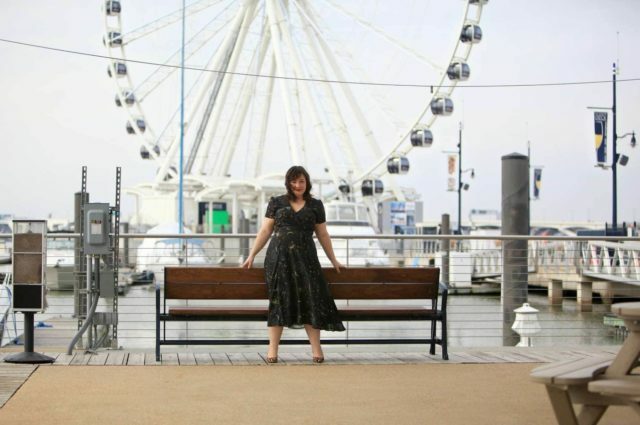 and think Gwynnie Bee could nudge me out of my comfort zone a bit more. I tried Gwynnie Bee a few years back. It worked for awhile but then everything I wanted was never available and it was frustrating. Would love to give it another go! GB seems like a great way to breathe some life into my wardrobe without being stuck with a closet full of statement pieces. Would love to try this and add some new trendy pieces to my spring wardrobe. I absolutely love that dress! And I would love to refresh my style this spring by trying something from Gwynnie Bee. I am recently back to work after having my second child and I would love to use the service to try some new styles and figure out what will flatter my changed body! 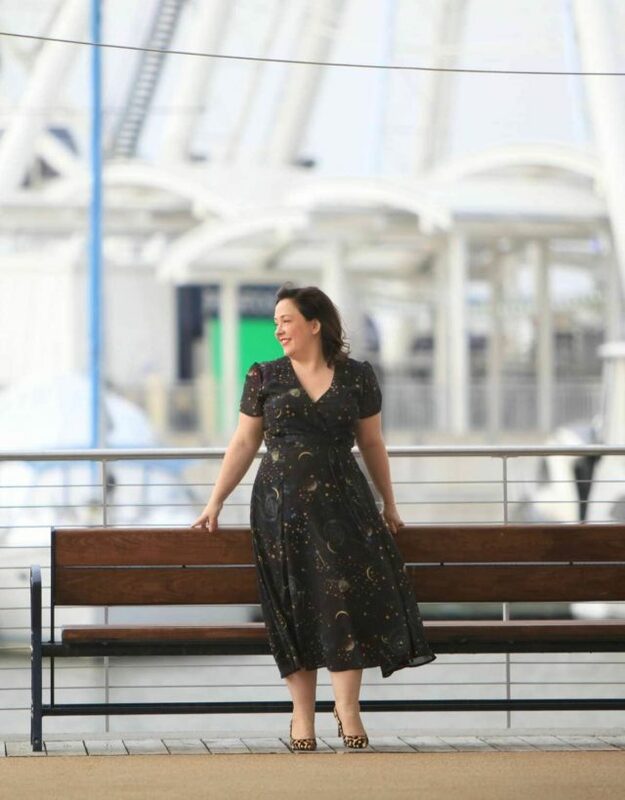 I tried the free month of Gwynnie Bee and it was one of my most stylish months ever! (A few recent months can compete because I’ve actually settled on a personal style, which is super exciting.) I’d love to be able to try some new brands and experiment with higher-end items! I haven’t been interested in a subscription service before- don’t want to commit or deal with the hassle of sending things back. But this amazing print has me reconsidering! What an awesome dress on you! I love the print. That is a pretty print! I just started with Gwynnie Bee in January with a free 30 day trial. I really like how they post customer reviews on items, and you can see how the clothes look before adding to your closet. I also like how it gives me the chance to try new brands and companies that are outside of my current Talbots/Nordstrom box. I did Gwynnie Bee a while back, too, but I’m thinking about giving it another try. I’d like to try it to allow more novelty and trends into my wardrobe – I’m loath to buy something too trendy, but the chance to try a trendy piece in my wardrobe and keep it if it works, or return it if it doesn’t, is super appealing. I would like to try Gwynnie Bee I just worry about the time it takes to set up to make it a worthwhile relationship. Granted it would be from the comfort of my living room vs running around to different stores and struggling in dressing rooms, but sometimes I can’t fathom spending another evening in front of the computer screen after working all day. Will they curate a closet for you based your style, sized, likes/dislikes? I think you’re thinking of programs like Dia & Co or Stitch Fix. With Gwynnie Bee, they have new releases usually every week. When you have time you can stop by their site or app, see if there’s anything you like and save it to your closet. They will auto send you items from your closet. If you like it, wear it, you can even buy it (your credit card is on file so it’s super easy). If you’re over it or didn’t like it, put it in one of their pre-addressed purple mailing bags and they’ll send you another item. It’s one of the lowest maintenance programs I’ve ever tried. It’s like old school Netflix (back when it was CDs) but for fashion! 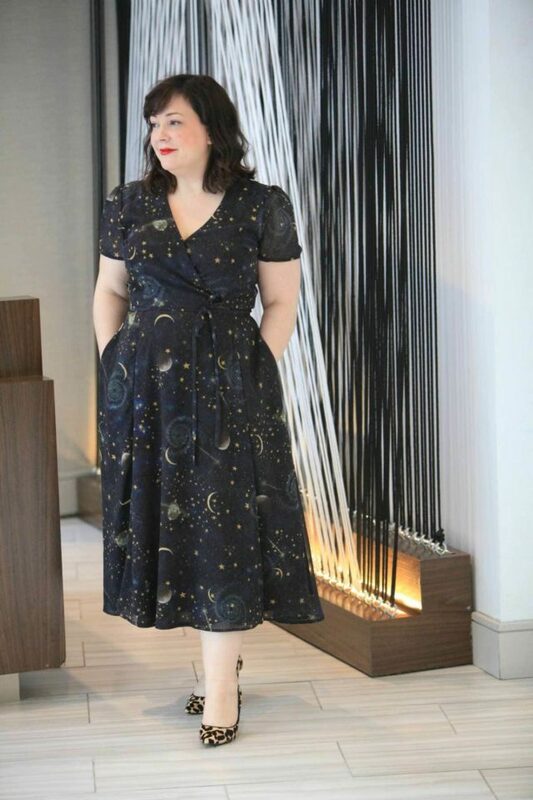 OMG, that constellation print! I would love to try a subscription service, but feel a little nervous about investing in it. I would love to give it a go though! 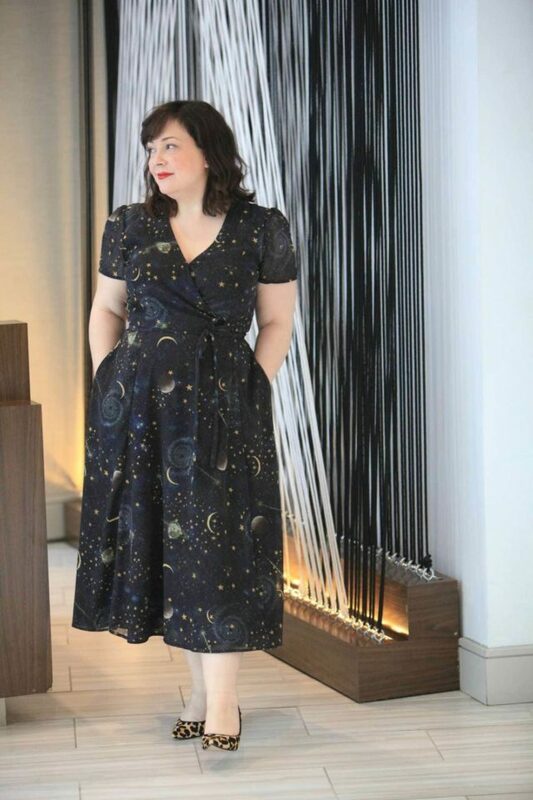 I love everything you post wearing Gwynnie Bee! I need to give them a try! I need a few dresses for work and play. The colors and styles are lovely. My wardrobe is shabby and needs a pick-me-up. I often play it safe and am drawn to the same colors. I know trying Gwynnie Bee would get me out of my comfort zone! They have such a huge variety. I’m sure I would find many selections I like.. Honestly, that is one of the prettiest dresses I’ve seen! I love that print. Would love to try Gwynnie Bee! That dress…it may not ever leave my house. I could bring more color into my outfits and improve the overall style of my wardrobe. I’ve been a loyal GB subscriber since 2012, and I love their service!! I found them via your blog and have never looked back since the first box! I have recently started losing and I was so excited to find out they will be offering a larger range of sizes so I can continue to enjoy the variety. Maaaaaaan! The hits just keep on coming! What a cool giveaway to give them a try! Thanks! I’m a long time fan of the blog and I’d love to give Gwynnie Bee a try. A subscription to Gwynnie Bee would pull me out of my jeans and T shirt rut. Maybe into a few dresses! I’ve long been intrigued by Gwynnie Bee. Since my weight fluctuates I like the idea of trying new things without worrying that it will just sit in my closet, waiting for my next weight gain or loss. I’m still hesitant on the idea of subscription clothes services so would love to check out Gwynie Bee! One of my other fav bloggers–Authentically Emmie–also swears by them. This dress is absolutely stunning on you–the color, the cut, everything about it. It looks amazing next to your skin! I know my style pretty well but tend towards just a few tried and true brands. I’d love to expand my horizons and try out some new looks with Gwynnie Bee. I tried Gwynnie Bee a few years ago and stopped because I found that there weren’t as many size 12-14 clothes as I would have liked. I’d love to try it again to see if that has changed! I feel like Gwynnie Bee may be able to help me get out of my current clothing rut and try more dresses. I always love seeing what you select! I think Gwynnie Bee would help with my personal style because I’ve been undergoing a style transformation and have been hesitant to purchase anything new because my tastes are changing. A subscription to Gwynnie Bee, where I can get new things each month without committing to purchasing, would help me hone my style and figure out what I like! I’d love to shake up my wardrobe and trying red dress with the black print on the giveaway ad would be a great place to start! I love the idea of being able to try out risky pieces to stretch my existing style. GB would let me test drive new options before I buy…sometimes just trying something on just isn’t enough! i imagine these would be such flattering clothes. i love the print of that dress you have on. Goodness! I love Gwynnie Bee and I’m so excited that they are offering more sizes so that I can finally partake. I have a strong personal commitment to sustainable clothing sources and Gwynnie Bee is so innovation in that realm. The concept is great! I have been working on some fashion-fearful + size pals, but they are worried they won’t know how to style things. I would absolutely love to try Gwynnie Bee! My style has been in a rut for years and it seems as though this would be a convenient and effortless way to get started on my path to style again. Would love the chance to add some versatile pieces to my wardrobe! Those shoes are perfect with that dress! Love this dress on you and finally!! On the petite sizes! I’m so happy they will be carrying petite sizes! I seriously don’t know how i HAVEN’T tried Gwynnie Bee yet — after hearing you (and so many others!) rave about them for years, I keep telling myself to just DO it! While I would LOVE to lose some weight, I also know that I need to love the body I am in here, now, and today. THAT is what Gwynnie Bee could help me with. I have that dress in a different print. It’s so easy to wear and I love the “flow” of the skirt. I’m thinking of wearing it to a wedding in April, but I’m struggling to decide if it will work as the temps in our area can still get cold in April and I just don’t know what kind of jacket/sweater/wrap would work with the cut. I have a short military style (but dressy) jacket or a black cardigan. Any thoughts? (I’ve been planing to post this question on the FB group page). Is the wedding outside? If not you likely won’t need to wear the covering for very long. If it’s a day wedding you could do a shorter fitted cardigan, or a pashmina as a shawl/wrap. I don’t think a jacket would be the best bet for this dress, though I haven’t seen your jacket. I’m hoping that the new size range makes Gwynnie Bee a good option for those of us who wear a mix of sizes! I’m not usually a ‘dress’ girl…but I have a few weddings this spring and need to step-up my game. Gwynnie bee, here I come shopping! I’d like to try the service to find pieces that would get me out of jeans on non-work days. I would say my sense of style could best be addressed by helping me get out of the style rut I’m in. New ideas, shapes and colors could go a long way in terms of changing my look (and outlook) for the better. Gwinnie Bee seems like a low risk way to try things out. I wear dresses to work every day and am always looking for new ones, as well as new cuts, patterns, etc to keep my wardrobe fresh. As a single mom, however, I am also cautious about my wardrobe budget, so I would love to know whether a service like B would be a good way to stretch my dollars a bit while still having fun with my clothes. I LOVE Gwynnie Bee! I’ve maintained a subscription since 2013 and love the variety! I’ve thought about using this service and look through their site all the time. I LOVE the dresses. But, I’m a chicken and I’m not always certain I can justify the expense since I’m always at home. I tried Gwynnie Bee a few years ago, and I think about going back often. I struggled with sizing inconsistencies/ lack of awareness of how particular brands fit when I initially set up my closet, but reading reviews helped. The program has progressively improved. More reviews with photos, more brands, more sizes, more new releases, the ability to buy, and much more. Worth it to try it again!